An ice climber advocates an ax-and-tell policy. Suspended 60 feet above the ground, I kick the sharp frontpoint of my crampon and swing the toothy pick of my ice axe into a frozen waterfall. My arms shake with exhaustion, my biceps screaming from months of neglect. A discomforting millimeter of metal keeps me in place. The blood has drained from my hands, which Ive been vigorously swinging overhead since my feet left solid ground. My fingers dont hurt anymore because I cant feel them, though I know the searing pain that will come when they begin to warm up  like my fingernails are being pulled off by a pliers. This will counter-balance my exhausted exhilaration in reaching the top. No pain, no gain, indeed. At the end of each pitch, I find myself sweat-drenched and steaming through my layers. For sheer physical exertion, ice climbing makes Nautilus look like R&R. The upper-body workout rivals any other winter sport, and, as a calorie burner, theres nothing like it. If the hike to the climb isnt enough exercise, the shivering while you belay your partner burns fat faster than a StairMaster. While it may not sound like fun to most people, ice climbing is growing faster than, well, an icicle in January. It appears that the indoor wall-climbing craze has inspired record numbers of vertical junkies to venture out onto real rock, and for many, climbing is not just a fair-weather pursuit. Ive become one of those junkies. My first ice climbs last winter werent pretty  I was frequently twisted into gymnastic contortions and left flailing. But with a season of strength- and technique-building under my harness, Im starting to get the swing of things. Mountaineering is the forefather of vertical ice: When early climbers would reach a low-sloping, icy section en route, they would spend hours hacking steps into the ice with an extra-long, wood-handled mountaineering axe and slowly walk their way to the summit. Now, thanks to technological advances, what was once considered the crux of a climb may only be the approach. 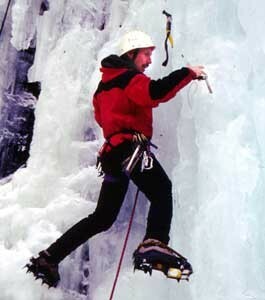 Present-day ice climbers can challenge themselves on vertical and overhanging ice, and mixed rock-and-ice climbs. They ascend with contoured carbon-fiber tools in their hands and rigid, vertical frontpoint crampons locked on their boots. The newly refined ice axes give modern climbers much more security on ice, while curved shafts help them hook protruding formations and swing over bulges. Crampon points have become ice tools for the toes, and the boots keep your feet almost warm enough to compensate for your freezing hands. A read through the annals of ice climbing history would elicit a chuckle from any modern climber. The first recorded ice climb in the East was in 1894, when three gentlemen attempted the Tuckerman Ravine headwall. They didnt make it, but had better luck the next year when they brought along an ice axe. In 1928, after a party ascended another icy gully in New Hampshires Huntington Ravine, the journal Appalachia confidently proclaimed ice climbing was at its pinnacle, and nothing was left to be done, ice-wise, on Mt. Washington. Their crystal ball must have cracked when climbers  inspired by the ascent  picked their way up glassy eastern cliffs with renewed ambition and success. The vertical challenge is a climbers addiction, but the sheer irony of ice climbing is also compelling. Ice climbing is unnatural. People should not be able to claw their way up fragile, temporal curtains of frozen water. When I reach a particularly thin, steep pitch with little for the tools to bite into, I question my own sanity. Ice is unpredictable and ever-changing. Some ascents have never been repeated because the ice never came in a second time. Glimmering and glinting, ice has a thousand different textures and formations. In the morning it can be brittle and nearly bulletproof, fracturing and sliding off in chunks or sheets with every swing of the tool. On the same route in the afternoon, a climber might gracefully sink his tools into ice that is deep blue and forgiving. I second when I climb, leaving the leading to my partner. Held tightly on belay, seconds can challenge themselves on steep ice without worrying about a big fall if the tools pop off. If the lead climber falls, hell go twice as far as the last screw he placed for protection  if he placed it well. Thirty years ago, the same fall might have taken him all the way to the ground. Only recently have ice screws become worth their metal  one more reason novice climbers like myself can ascend icy buttresses that once might have been lethal. Because of the advances in equipment, ice climbing is safer than ever  and many say its easier than rock climbing. Physically, if you can do a couple of pull-ups, you can ice climb. However, if you get cold feet, or if youre afraid of falling  especially with a minimum of 29 knife-like points strapped to your feet and hands  its not for you. The price tag for ice climbing can be prohibitive, too  though for some the gear is part of the draw. The sport is equipment-intensive, and the mandatory ice tools, boots and crampons will run you about $750. If you need to add a harness, rope and belay device, round that cost up to a grand. Ice screws and other accoutrements are additional. Some climbers postulate that a few less-than-ideal skiing years have turned more people onto Northeastern ice. It is, after all, a winter sport that can be tackled when the mercury has plunged and the ground is bare, or under sunny skies, even in rain and snow. What could be better in Vermont? Climbers can smirk at the freeze-thaw cycles that skiers and boarders dread. Humor may be as important in ice climbing as a good axe  it counterbalances the knowledge that gear sometimes fails, climbers sometimes misjudge their own capabilities, and ice sometimes behaves differently than anticipated. On the other hand, ice climbing has many pleasures  the thrill of the vertical, the adrenaline of pushing yourself to your limits, the camaraderie with your partner. And nothing touches the exhilaration of reaching an icy pinnacle, even if youre quivering with fatigue, cold and maybe a few muscle cramps. For this climber, however, the best part is recounting my adventures afterwards  with warm hands  from the comfort of home.